Home → E-Juice → VanVal Vapor Review! In this article, I will be reviewing VanVal Vapor’s sample pack. Firstly, I would like to thank VanVal Vapors for sending this over for review. The VanVal Vapor sample pack includes 7 different e-liquids and the pack I received were all in 1.5mg, and max VG. All of these e-liquids were tested within a 2 week period, which gave it time to steep to see any changes. For each e-liquid review, I will go over the inhale, exhale, throat hit, and overall thoughts. For testing these e-liquids, I used three different setups for testing these flavors. Each atomizer had a different coil build, and had different resistances. The first flavor I tested in the sample pack was Albino Rhino. This e-liquid is described as a succulent creation of a delicate, rich cream paired to perfect with vanilla and layered with fresh berries. Overall thoughts: Overall, Albino Rhino was extremely good when first getting, and when letting it steep. This is a smooth balance of a mixture of berries with vanilla and cream. I could not pick out the exact berries, as to me it tasted of many different berries without any one being distinct. The vanilla and cream finish was really well done, and pair excellent together. Steeping did not really change the flavor all too much, and it relatively stayed the same over time. Overall, this was definitely one of my favorites in this sample pack. The second flavor I tested was Father’s Load. This e-liquid is described as a sweet bakery blend with hints of hazelnut, a dash of tobacco and a concoction of creams enveloped in vanilla custard to make this legendary blend. Exhale: Earthy tobacco tones with vanilla followed by bakery notes and vanilla custard to round it out. You get a lot of custard on the very end of the exhale. Overall thoughts: Firstly, I would like to say I am not a fan of tobacco vapes, but this one definitely changed my mind. The earthy tobacco notes are well executed, and the flavors just blend well together. At the very end of the exhale you get a nice, creamy vanilla custard that really rounds it out. In addition, steeping did not do too much for this e-liquid and was good to go out of the mail! Overall, a great mix of sweet and earthy tones, but definitely on the sweeter side. Lastly, there was very little hazelnut, but still a wonderful vape. The third flavor tested was Frosted Snaps. This e-liquid is described as a full-bodied dessert rolls onto your palate in a delicious wave of cinnamon, hazelnut, and creamy homemade frosting. Frost gingerbread boys on the inhale, cinnamon raisin roll on the exhale. Inhale: Bakery notes with a hint of cinnamon and raisin. Exhale: Frost cinnamon raisin, that has a creamy texture. Overall thoughts: This flavor is definitely spot on to the description. I was actually surprised by this flavor, and never thought I would actually like raisin in a vape, but this definitely changed my mind. This is a well balanced and smooth e-liquid, and different than anything I’ve ever vaped. With steeping, this e-liquid became more rounded out, and blended ever more together after 2 weeks. Huge thumbs up for this e-liquid as it was sweet, smooth and well blended! This is definitely one of my favorites of the line! The fourth e-liquid I tested was How Many Puffs. The description of this e-liquid is as follows: Reminiscent of your favorite sucker back as a child. A chocolatey center completely engulfed in a delightful, raspberry candy. How many puffs will it take you to finish the bottle? Exhale: Raspberry Fruit/Candy Mix with a slight hint of chocolate. The chocolate was almost nonexistent. Overall thoughts: This is definitely a raspberry vape done right. A lot of raspberry vapes can definitely taste like medicine or just be completely overpowering. This raspberry was definitely not, and tasted like a cross between a raspberry candy and raspberry fruit. I do wish there was more chocolate, but overall a pretty good vape. Steeping did not change this e-liquid not even slightly, and tasted pretty much identical from first receiving it and after 2 weeks. This is not my favorite of the line, but I did enjoy vaping it. The next e-liquid that I tried was P-Nut Butta. This e-liquid is described as an opulent combination of classic peanut butter matched brilliantly with various creams to deliver a mouth watering peanut butter. Exhale: Mostly Peanut Butter with a light cream as well. Overall thoughts: This is a very authentic tasting peanut butter vape. The only issue I find with this e-liquid is that there is not enough cream for my taste, and sometimes it can seem like the peanut butter has a dry note. I’m not sure if it has to steep any longer, but with a 2 week steep time, only a light cream note came forward. Overall, it is a good peanut butter vape, and if that is a flavor you are looking for, then this would surely be something to try. The 6th e-liquid I tried was Mind’s Garden. This flavor is described as a divine blend of luscious fruits, each infused with a mouthwatering bust of carbonated soda to quench any thirst for a delectable all day vape. Exhale: Slight carbonation taste with fruit tones. Overall thoughts: This flavor was definitely not for me, and the reason why is the flower undertones I was getting on the inhale. When first receiving this e-liquid I did not notice it, but after 2 weeks of steeping it definitely came through. I’m not sure if it’s the fruit mix mixed with the carbonation that gives it that taste, but it definitely was something I did not enjoy. There are fruit tones there and a slight carbonation taste so this e-liquid did match the description, but I personally did not enjoy it strictly, because of the flower undertones mentioned in the inhale. The last and final flavor in the sample pack was I’m Not Crazy. This e-liquid is described as strawberries and maple fused together with a dollop of cream to bring a balance to such an exquisite recipe. Exhale: Maple dominant exhale with a slight hint of strawberry. The cream is noticeable on the back end of the exhale, and rounds out the flavor a bit. Overall thoughts: This is a maple heavy vape, almost to the point of it tasting like maple syrup. The strawberries and cream round it out a bit, but I do think there is just a tad too much maple in this e-liquid. This is a decent vape, but personally I did not like it a whole lot since I do not like maple flavored e-liquid. If you like maple flavoring, then this is an e-liquid definitely worth trying. In conclusion, VanVal Vapor’s sample pack thoroughly impressed me. The overall throat hit of all the e-liquids were as expected, and none had any type of peppery taste. 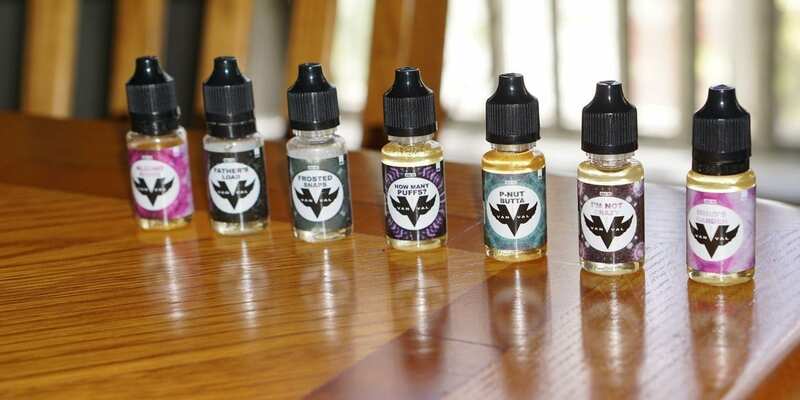 All of their e-liquids are Max VG, and they have a ton of nicotine strengths for you to choose from! This is great as there are still vapers who prefer a higher nicotine strength. Their e-liquid selection is definitely different than what most vendors carry, and most are good in their own surprising way. For the price, this e-liquid is definitely hard to beat. 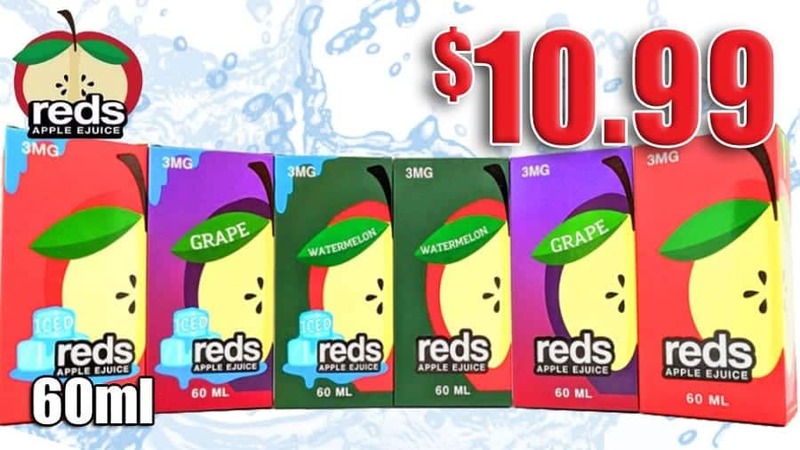 $15.99 for a 120ml or sample pack is just a great price overall, and for me three of these e-liquids would be considered an ADV. The three for me that were best was Father’s Load, Albino Rhino and Frosted Snaps. Each of these e-liquids were not of my preferred flavor profile, but surprised me in how much I actually enjoyed vaping them! All in all, I highly suggest you give VanVal Vapor a shot, their e-liquid is great and they offer flavor combinations you typically do not see. Like said previously, for the price VanVal Vapor is surely hard to beat. For only $15.99 for a sample pack, you can’t go wrong! Once again, I’d like to thank VanVal Vapors for sending the sample pack my way for review!